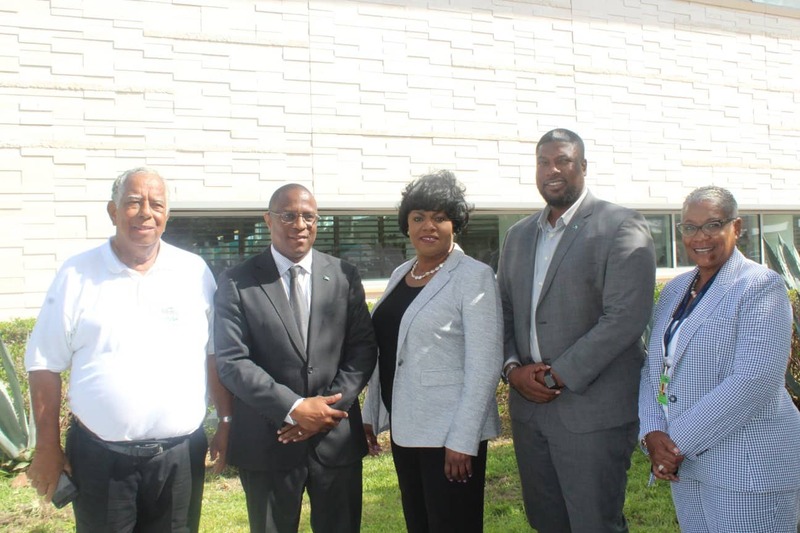 The Bahamas Agriculture and Marine Sciences Institute (BAMSI) approached the Nassau Airport Development Company (NAD) in a collaborative effort towards showcasing native fruit plants within the gardens located in the Lynden Pindling International Airport (LPIA). BAMSI expressed a desire to adopt a green space within these areas and plans ensued regarding the selection of plants, locations, etc. On Wednesday, August 15, 2018, a fruit plants inclusive of guava, mulberry and soursop were planted in Garden C by organizational leaders Vernice Walkine (CEO, NAD), Michael Pintard (Minster of Agriculture and Marine Resources) and Tennyson Wells (Chairman of the Board and President, BAMSI). Aware of the impact BAMSI’s partnership with NAD could have on the Institute, Minister Pintard said that the fruit trees donated today reflect the government’s focus on building a food secure future and how the introduction of native plants adds value to the airport as a destination. Garden C is LPIA’s most plush and vibrantly colored terrace, featuring Agave, Barbados Cherry, Ornamental Pineapple, Coconuts and Cocoplum, with the Guava and Mulberry being its newest editions. It also offers seating for travelling individuals to enjoy the greenery as well as a front row view of arriving and departing US flights. It presents an extraordinary opportunity to showcase native trees to our visitors, with LPIA facilitating approximately 3 million passengers on an annual basis , which represents an incredible market for BAMSI. This also provides us with an opportunity to introduce a younger generation of Bahamians to native plants they may not be accustomed to, as NAD hosts school tours of LPIA throughout the year. Also in attendance were Carlton Bowleg (Parliamentary Secretary and MP for North Andros and Berry Islands) Deborah Coleby (VP of Operations, NAD), Nicole Henfield (Manager of Landside Operations, NAD) and Mechelle Sweeting (Environmental Coordinator, NAD) who were in full support of this joint initiative. It was through the efforts Mrs. Henfield that this event was a success! Through the initial discussions with NAD’s Environmental department, BAMSI, led by Executive Director Dr. Raveenia Roberts-Hanna, connected with Mrs. Henfield who worked diligently with her Landscaping Team ensuring the ideal greenspace was selected for the plants and also that all arrangements were made. Agriculture plays a pivotal role in building bridges between communities, connecting with others and creating a beautiful environment. In the words of Tennyson Wells “BAMSI is a relatively young entity and it will benefit from a partnership with NAD”. Both entities look forward to expanding the local agricultural and environmental landscape of LPIA through future joint initiatives.